Imagine dining al fresco in Greece or Italy-what would be on the menu? Chances are there would be plenty of fish, fresh vegetables and fruits, nuts, olive oil, whole grains and some red wine. Contrast this imaginary meal with what you eat on any given day. Are there any similarities? If so, well done! 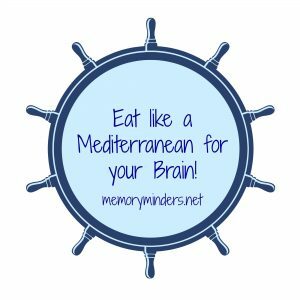 Your diet resembles what is typically called a “Mediterranean diet” which has been shown to be beneficial for overall heart and brain health. Continuing our series of posts on brain and memory wellness behaviors in honor of Alzheimer’s and Brain Awareness Month, let’s look at how nutrition impacts our brains. Generally, a Mediterranean diet has been shown to be a healthy, balanced way to approach nutrition. It is beneficial for heart and brain health as it includes healthy fats in oils, nuts and fish with Omega 3 fatty acids. It is chock full of an assortment of dark fruits and vegetables which provide a variety of brain beneficial vitamins, minerals and antioxidants. It includes whole grains which provide fiber and nutrients and are great for our heart, brain and digestive system. Here in America, we often eat more fatty meat, dairy and processed foods and less fruit, vegetables and fish. This Americanized way of eating can contribute to high blood pressure, elevated cholesterol, diabetes and vascular disease. All of which can contribute to heart and brain issues. Crowd your plate with a variety of dark fruits and veggies and eat them first! Fill up on these and you’ll be less apt to eat too much of the fattier, caloric dense meat or starches. Be creative with fruit and vegetables-incorporate them into snacks, breads, breakfast etc. You will consume more if they are spaced out throughout the day. Include Omega 3 fatty fish (salmon, tuna, sardines) in your diet at least once a week or more. Whole grains are your friend! Swap for or mix them with white grains. Utilize healthier oils like canola, sunflower or olive instead of butter or margarine. Drink mainly water, coffee or green tea. Dark fruit juices and red wine in moderation provide additional antioxidants. Avoid empty calorie & nutritional beverages like soda at all costs. 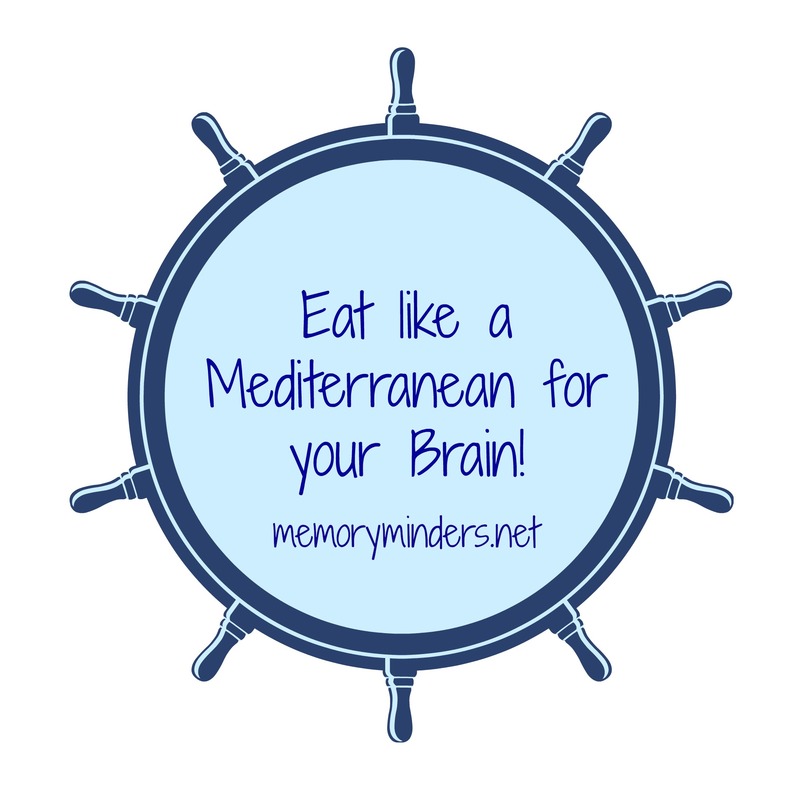 Use these tips, eat like a Mediterranean and help your brain!